Last year, I did a post about how a Penn writer and Penn producer came together to create a big movie hit. 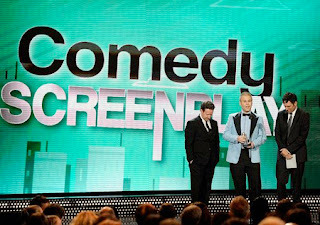 Tonight that Penn writer wins for his screenplay and he accepts sporting an awesome blue tux. After the jump reacquaint yourself with the movie and check out a cameo in the film by our Penn alum writer! As you may recall, Josh Heald (W'00, Editor-in-Chief 34th Street Magazine ('99), Penn Jazz) wrote last year's hit Hot Tub Time Machine . And on a related fun note, if you take a closer look at the movie, you'll note that Josh has a cameo in it as the Pet Shop owner (see screengrab below). Remember, we have more Penn alumni with film cameos as well! Find out how Josh got the movie made ....and where Josh would be at Penn if he took the hot tub back to the year 2000 HERE!